A proven touring workhorse. 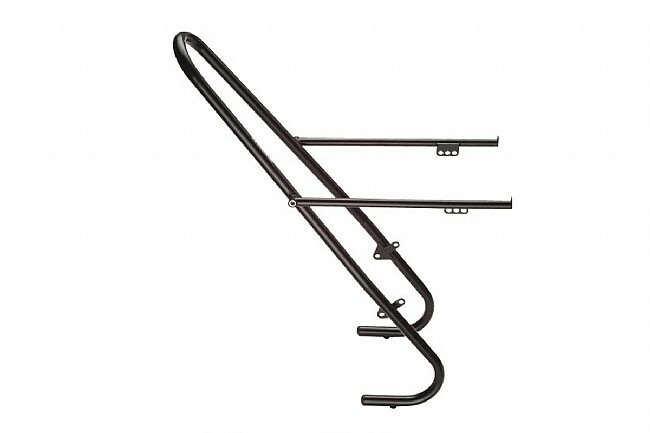 The German-engineered Tubus Tara Front Rack features a bombproof construction, with stunning looks and a low weight to boot. The Lowrider design provides more front-end stability and better bike handling compared to top-loading front racks. Pair the Tara with the Cargo Rear Rack for the ultimate, tough-as-tails touring rig. All Tubus racks are backed up by a 30-year Worldwide Guarantee against technical failure. The Cargo and other CrMo models are also supported by an additional 3-year Mobile Guarantee against technical failure. This means, within the first 3 years after purchase date, a broken carrier will be replaced and a new one will be forwarded to any place on earth - wherever you are - for free. Please see the Tubus website for warranty details. *Tubus also produces a mounting adapter set for forks which are not equipped with mid-blade eyelets. If you are unclear about compatibility with your fork please contact us.